Whether taking a stroll through the park or conducting patrols, do it with peace of mind carrying the protection of Sabre's Red Magnum Pepper Spray. Its non-lethal has a potent 10% oleoresin capsicum concentration delivering a blistering 2,000,000 Scoville Heat Units capable of stopping the most aggressive combatant in their tracks. 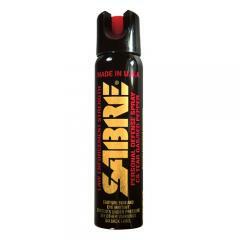 The defensive spray is designed to immediately inflame the sensitive membranes of the eyes, throat, nose and ears, temporarily disabling the would-be assailant. With the combatant's vision and other senses compromised, users can get away with time to spare. The spray leaves behind a UV residue to ensure suspects are identified and locked up where they belong. Inert Practice Spray 54 oz. Inert Practice Keychain Spray .54 oz.